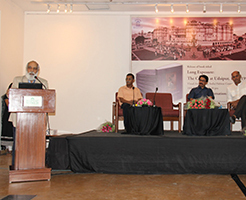 It was a memorable occasion, the International Museum Day on May 18th, 2014, when we released the book titled, ‘Long Exposure – The Camera at Udaipur, 1857-1957’, at the Visual Arts Gallery of India Habitat Centre. Our Guest of Honour was Dr Venu Vasudevan, Director-General of National Museum, New Delhi, a young and dynamic IAS officer who admitted that this was the only function he was addressing on International Museum Day. Dr Venu was all praises for not just the book but also the untiring efforts of the Maharana of Mewar Charitable Foundation, Udaipur, of connecting Mewar’s heritage with new and different audiences. We are very grateful for his kind words and gracious presence at the book release function. The ‘Long Exposure – The Camera at Udaipur, 1857-1957’ is published by the Maharana Mewar Historical Publications Trust, under the aegis of Maharana of Mewar Charitable Foundation. It marks an important milestone in the ongoing revitalization and modernization of the City Palace Museum in Udaipur. It complements the Bhagwat Prakash Gallery of the City Palace Museum, dedicated to the display and exhibition of photographic material from the Pictorial Archives of the Maharanas of Mewar (PAMM). Many of you may recollect that The Bhagwat Prakash Gallery was inaugurated on March 15th, 2009, by Padma Bhushan Ebrahim Alkazi, founding-director of the National School of Drama. With the ‘Long Exposure – The Camera at Udaipur, 1857-1957’ we are witness to the unfolding of another facet of Living Heritage. Materials preserved in our Pictorial Archives are now being shared with Indian and global audiences. It is an ongoing process of channelizing the power of our heritage and making it relevant, meaningful to contemporary times. This, in essence, is what exemplifies Living Heritage. Our focus on Living Heritage teaches us to respect the past; to honour all those who have enriched our lives through their work and documentation done years and decades ago. This publication is a tribute to all our forefathers, their managerial and administrative skills in ensuring that archives were maintained, and passed on from generation to generation. We also paid our tributes to the ‘nameless’ staff and workers down the line who made sure that orders from above were carried out and materials were preserved. As the authors explained, “the ‘Long Exposure – The Camera at Udaipur, 1857-1957’ is the first comprehensive introduction to the rich collection housed in the City Palace Museum. While the book recalls the story of the Royal collectors and their engagement with photography, photographers and the printed image, it also traces the archiving process and subsequent study of the collection. A technical note demystifies early photographic processes and new research on the archive is presented. Congratulations to those who worked tirelessly to make the publication and its release function a success…May the blessings of Parmeshwaraji Maharaj Shree Eklingnath ji be showered on all!